You are here: Home / Featured / Beautiful Gold Horse Bracelets: Can You Ever Have Enough? 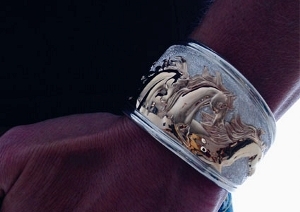 Beautiful Gold Horse Bracelets: Can You Ever Have Enough? Happy Thanksgiving everyone! We’d like to take a chance to wish each and everyone reading these words the very happiest of holidays. May your celebration be full of lots of love and laughter! We’re very thankful for each and everyone of you, our friends and customers. 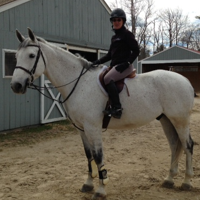 It’s been a blast exploring the world of fine horse jewelry with you! Now let’s take a look at gold horse bracelets. Do you want to see one beautiful, romantic piece of fine horse jewelry? 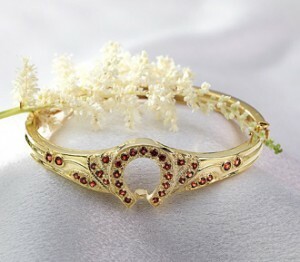 Check out this Gold and Garnet Horseshoe Bracelet. I know Christmas is coming, but even if you want to think ahead here, this 14 gold horse bracelet would be perfect for Valentine’s Day. The bracelet is made using an original Victorian mold – that explains the delicate, almost airy look and feel – in lovely 14K Yellow Gold, set with eye-catching, elegant garnets in a horseshoe. 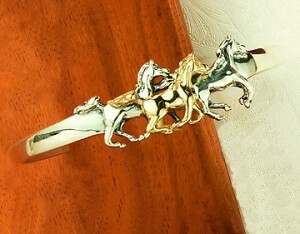 A trio of beautiful running horses speed across this bracelet, worked in 14K gold and sterling silver. It’s a high-energy piece of jewelry, fun to wear. The elegant style means you can wear this gold horse bracelet with casual outfits, in the office or with evening wear. 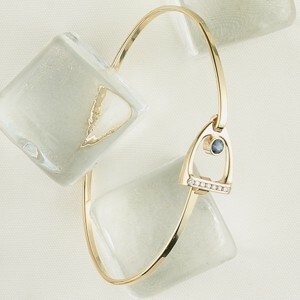 The 14K Gold Stirrup Bangle bracelet with Sapphire and Diamond delivers top-notch elegance and sparkle. You couldn’t ask for more classic equestrian design. The simple shine of 14K gold shining against the wrist, accented with a beautiful blue sapphire and .10 ctw of diamonds looks great. Don’t be surprised if this becomes her favorite piece of jewelry! Knock her socks off with this breathtakingly bold elaborately detailed gold and sterling silver horse cuff bracelet. It’s nearly 2″ across at its widest point – this is a piece of fine horse jewelry that will be noticed! The craftsmanship on this horse bracelet is really superior.